Are you the type of person who bakes a Betty Crocker cake or do you do everything from scratch? Either way, it is fun to present a cake at an event. Whether it’s a child’s birthday party or an anniversary, a cake does a great job in helping people feel special and loved. It’s a way to celebrate someone and make them feel appreciated. After the cake has been baked and decorated, there’s only one thing left to do with it – you’ve got to cut it. Now cutting the cake can be a stressful event. If you don’t do it right, you can ruin the decorations and frosting patterns, which someone has spent a lot of time and effort on. There are a few cake-cutting hacks out there, but the one we’re about to share with you takes the cake – har, har! If you’re tired of getting uneven cake slices that look like they’ve fallen off an ancient pyramid, it’s time to learn something new and put your cake skills to the test. The trick today works wonders on a large, round cake. It’s an easy way to cut the cake that ensures everyone gets a slice that is even and equally delicious. You don’t want to give one guest a “diet-sized” slice and another guest a gargantuan piece. That’s going to make someone feel a certain way. Instead, you just need to follow this trick, and you’ll have even slices every time you cut a cake. 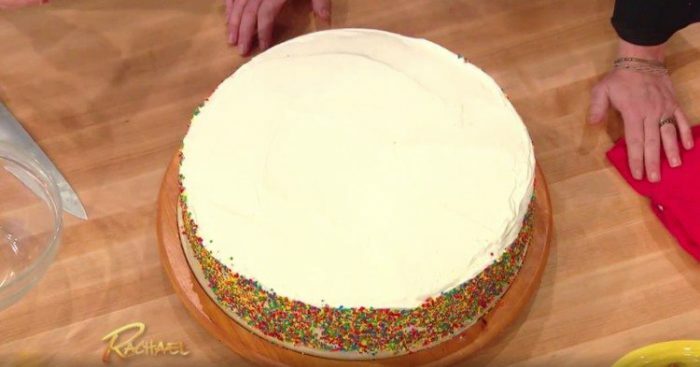 Leave it to Rachel Ray on her show to help people figure out a trick that helps them cut cakes evenly every time. All you need is a glass bowl, which you probably already have in your kitchen. With that simple item, you’ll be able to make an outline in the center of the cake that can help guide your knife cuts. Caters and restaurants use this trick for round cakes all the time. And if you work at a restaurant and don’t do this, we won’t tell anyone – but pick up the knowledge and put it to use. Your guests will be impressed. Take a bowl that will fit at the center of your large, round cake. Make sure it still allows about five inches from the center to the outside. So we are talking about a very large cake here. Press the bowl upside down on top of the cake. It will make an outline. Lift it up and put it in the sink. Then take your knife and cut the cake around the edge of the bowl. You’ll essentially be left with a cake inside of a cake. Then cut slices from the outside of the cake to the edge you cut using the bowl. Now you’ll have even slices that are not too big and don’t reach all the way into the center. Then serve your cake. When you finish serving the outer pieces, you can cut the smaller cake in the center as you normally would. 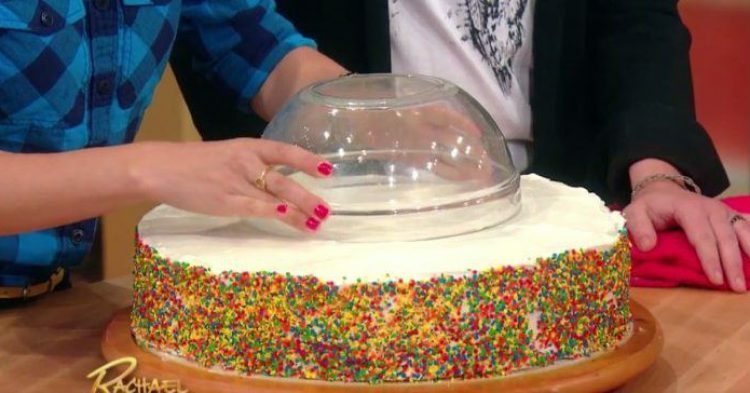 What do you think about this cake-cutting trick?